An unusual though simple tie rack can be made by supporting the tie bar in the center. By this arrangement the ties can be placed on it from either end, thus avoiding the tedious threading through, required on the ordinary rack supported at each end. 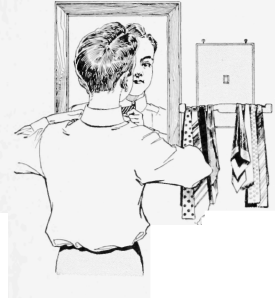 Collars may be hung on a peg placed above the tie bar. The pieces can be glued together and a good finish given in the usual way. The rack can be hung up by two screw eyes. The material required consists of four pieces, dimensioned % by 5 by 8 in., % by 7/8 by 7 1/2 in., 3/8 by 5/8 by 3 1/8 in., and 7/8 by 7/8by 2 in. respectively. - Contributed by Arthur C. Vener, Dallas, Texas.